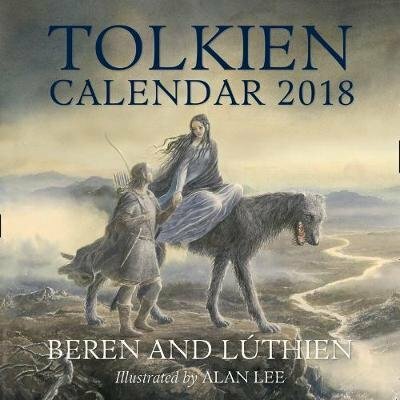 The official Tolkien calendar, this year containing 12 of the finest watercolours by Alan Lee, selected from BEREN AND LUTHIEN by J.R.R. Tolkien, and accompanied by numerous pencil sketches, many unique to this calendar. The Tolkien calendar has become an established publishing event, eagerly looked forward to by Tolkien fans the world over. This year's is more sumptuous than ever, and is not only illustrated by the acclaimed and Oscar-winning Tolkien artist, it has been designed by him, too, with the same care and attention to detail that has seen his work embraced by the Tolkien Estate, Peter Jackson and discerning fans around the world. The content itself is particularly special, as it is inspired by a Tolkien work that is seeing print in its complete form for the very first time. To accompany each watercolour painting from BEREN AND LUTHIEN, the newly published epic tale of adventure by J.R.R. Tolkien, every month features complementary pencil drawings selected by Alan and there are also brand new sketches produced exclusively for this calendar. Alan Lee has depicted famous scenes including Gollum and Bilbo, Rivendell and Smaug the Dragon in his celebrated illustrated editions of `The Hobbit' and `The Lord of the Rings', but with these brand new paintings and drawings he will take the reader deeper into the enchanting world of Middle-earth than ever before.